The Manufacturing Flooring Experts! — T.W. Hicks Inc.
Are you currently looking for the best flooring company for your manufacturing plant?! Just like in any situation, you want to make sure that you hire the best manufacturing flooring company around, and T.W. Hicks, Inc. is just that! Now, we could tell you all about how great we are and all the services we provide (which you should definitely check out here), but we think the best way to show our success, and why we deserve the title of the best manufacturing flooring company, is through our successful projects. No matter how big or small the project is, we will always make sure that our work is done on schedule, done well, and that you are beyond happy with the results! One of our bigger, and more exciting projects, happened in 2016 with the KONE Lighting Manufacturing Plant in Allen, Texas. During this project, we installed over 100,000 square-feet of flooring systems! And, as you can tell from the pictures, we were beyond excited with the end results! Although pictures say a thousand words, and these pictures might be able to speak for themselves, we want to give you some more information on this amazing project (a project so good that it won us runner-up for Project of the Year from Sikaflooring)! Like we said, this flooring project was quite a hefty one, with over 100,000 square feet to cover, but we here at T.W. Hicks, Inc. were beyond excited about this project. Throughout this manufacturing plant, we utilized three different flooring systems. These systems are put in place for different reasons, each of them being placed where they were most useful. Sikafloor ESD Control Flooring: Our first flooring system we put in, this was near the assembly area. This flooring system is perfect when electric components come in to play. 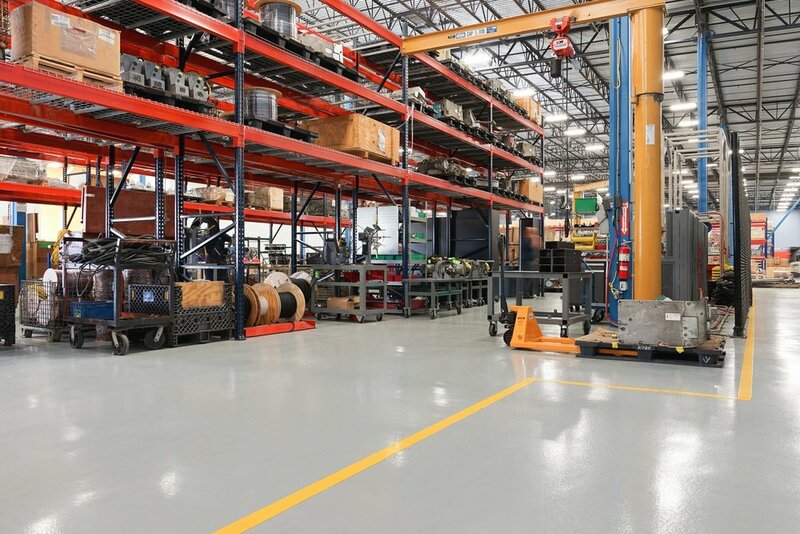 This flooring system is perfect for a light manufacturing company since it helps combat electrostatic! Safety first, of course! Sikafloor Morritex Coating System: The second system was in the Light Manufacturing building. KONE expressed their wants and needs for this area: slip resistance, easy maintenance, and low reflectivity. The system we selected not only contained those features, but it was also perfect for medium traffic, is highly durable, and super easy to maintain. As usual, we did our best to exceed our client’s expectations. Sikafloor EpoRok Epoxy Mortar System: For our third system, we knew that this space would be beat up more than the first two areas—KONE was looking for a tough flooring that was able to put up with whatever they threw at it. Of course, at T.W. Hicks, Inc. was able to find the perfect flooring system that could put up with the heavier items, while also being durable and tough—and this worked amazingly well for KONE! If you are looking for a customized flooring experience, make sure to contact T.W. Hicks, Inc.! Hung up on Hangar Flooring?